This easy peach upside-down cake is made in a rectangular cake pan, or divide the batter and ingredients and bake it in two 8-inch round cake pans. 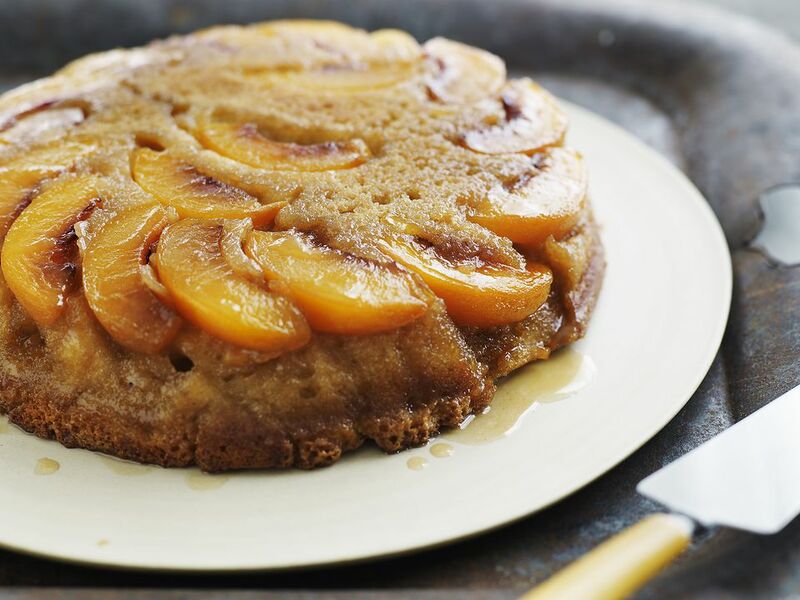 The peach upside down cake is easy and convenient because it's made with a cake mix. You might also like this fresh peach upside-down cake. Pour the vegetable oil or melted butter into a 9-by-13-by-2-inch baking pan; sprinkle brown sugar evenly in pan. Drain peaches, reserving syrup. Arrange peaches and some maraschino cherry halves, if using, in the sugar mixture. Add enough water to peach juice to make 1 1/3 cups of liquid; add liquid and 2 eggs to cake mix. Beat as directed on the package. Pour the batter over the fruit. Bake in the preheated oven for 40 to 50 minutes or until cake pulls away from sides of the pan. Let stand 5 minutes and then turn upside down onto a cake dish or large platter.